Why-U-Buggin can control all ants in the Colorado region. We have over 26 years experience, and have extensive training on recognizing what type of insects you have and what pest control product would be best to use. We also offer Green Products, So Give Us A Call for a free inspection or quote. We look forward to meeting you and providing you with a professional ant control service that is 100% safe & guaranteed. 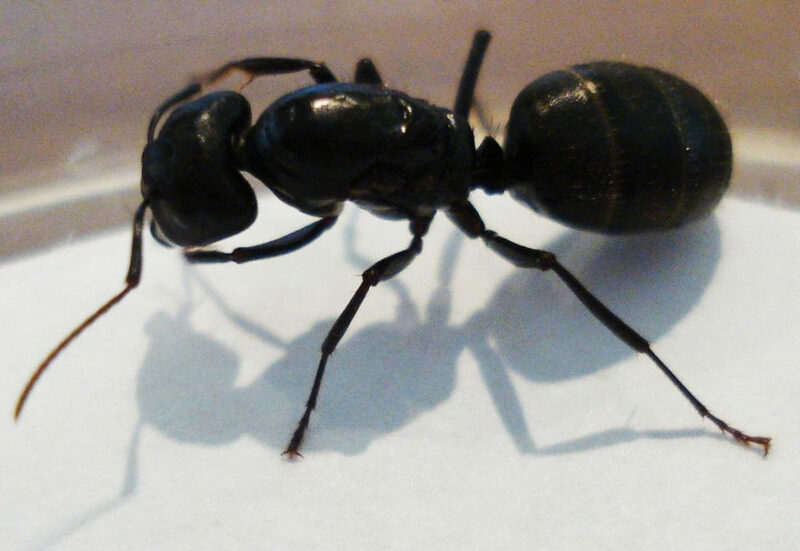 Carpenter ants, the largest of the ants within the United States, range in size from 1/8 to 1/2 inch long; with the queen ant being slightly larger. 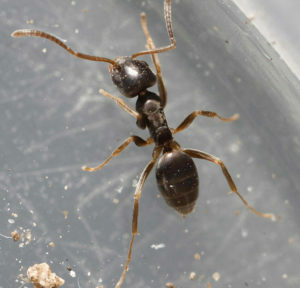 Worker ants vary in size and are mostly black. The black Carpenter ant is the most studied species in the United States, however, some species can range in color from red and black, red or brown. Mature ant colonies range in size from several thousand workers to tens of thousands of workers and when in ideal temperatures will complete their life cycle (egg to adult) in about sixty days. The worker ants excavate the nest, forage for food, and care for the young. They feed on sugar solutions such as sweets and the juices of insects they capture. Rustling sounds in wall voids may be an indication that there is a nearby colony. Harvester ants are not nearly as common today as they were back in the early nineteen hundred. These ants are 1/4 to 1/2 inch long and have square shaped heads and no spines. Harvester ants collect seeds and other body parts of dead insects and stores them in their nest as food for the colony. The good news is that Harvester Ants do not invade homes or structures but prefer to establish their nest around your yard and gardens, often destroying vegetation. Harvester ants are aggressive and vicious and when provoked they deliver a painful sting. Odorous house ant workers are 1/16 to 1/8 inch long, and coloration is brown to black. When crushed they smell like rancid butter; hence their name. When alarmed, the workers raise their abdomens. These ants swarm to mate from May to July, forming new colonies by “budding” off the original colony. 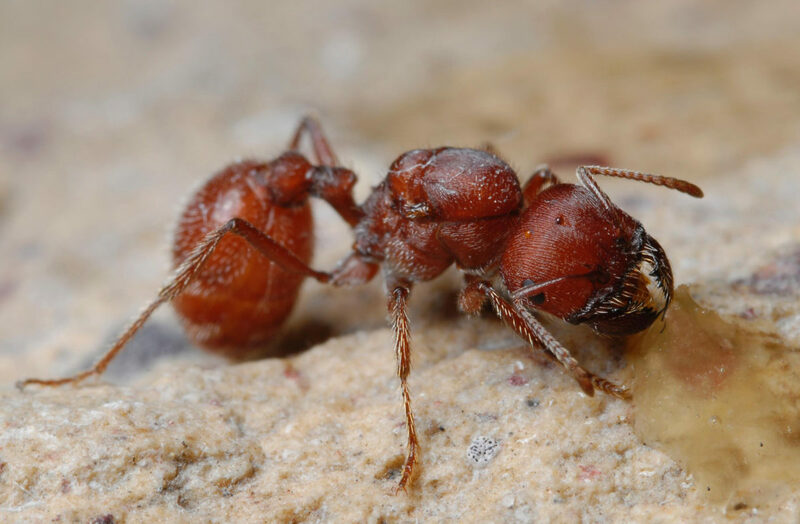 These ants often nest outdoors beneath stones and logs and within the nest of larger ants. They also nest indoors in wall or floor voids; around heat sources and crevices around sinks and cabinets. They also prefer sweets, although they eat almost any household food. They invade structures during rainy periods and after honeydew on plants has washed off. 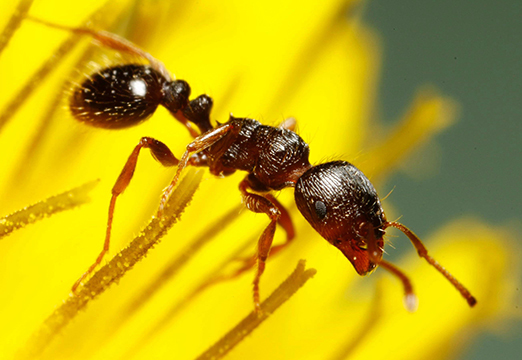 Pavement ants are 1/16 to 1/8 inch long with a dark body and lighter colored legs. They have two spines on the back portion of the thorax, and their bodies covered with stiff hairs. These insects are usually identified by the narrow, parallel grooves on their head and thoraxes. Pavement ants nest outdoors beneath flat stones, sidewalks, and concrete slabs as well as along curbing. They invade structures in search of food and are particularly problematic in areas where slab-on-grade construction is prevalent. Inside structures, they nest within walls, insulation, floors, and, during the winter, near heat sources. Pavement ants prefer meat and greases. Although not particularly aggressive, workers do bite and sting.